And that was it for Doctor Who games for the best part of a decade, though various other titles parodied the show - Doctor What, Doctor Goo - or included references to it: Micro Power’s 1983, pre-Mines of Terror Escape From MoonBase Alpha contains numerous thinly disguised Who characters, along with Marvin the (presumably paranoid) android; Odd Job Eddie, a Manic Miner clone from Strobe, has a Dalek, as does Brian Bloodaxe, Graftgold’s Paradroid and Mikro-Gen’s Herbert’s Dummy Run; Superior Software’s Stranded featured a time machine that looks like a Police Box and has a hexagonal control console. Enter Alternative Software which attempted to graft Doctor Who characters and monsters into a true arcade-style game. 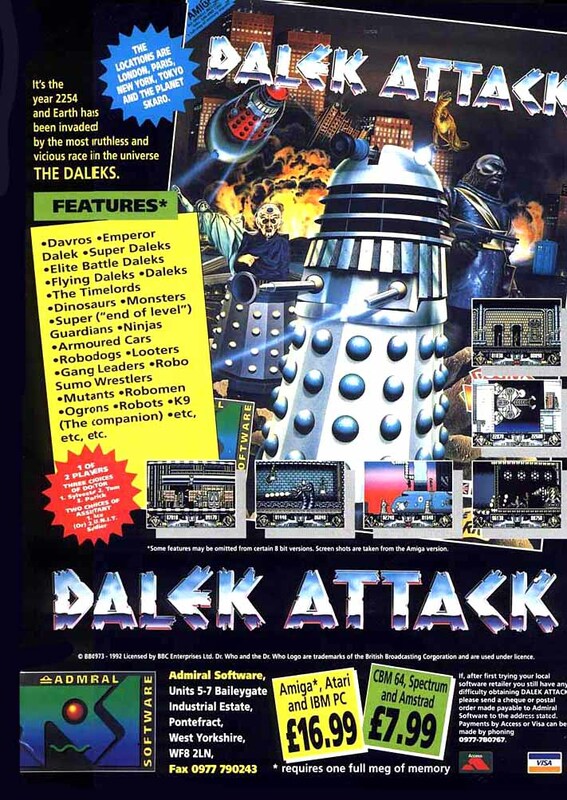 The result was Dalek Attack, released in 1992 on a new generation of hardware: the PC, the Amiga and the Atari ST, though Spectrum and Commodore 64 versions also made it to market. Dalek Attack was novel for a number of reasons: first, you could choose to control one of three Doctors - Patrick Troughton, Tom Baker or Sylvester McCoy - and a two-player mode allowed a chum to control either the Brigadier or Ace on the same screen. The graphics were faithful to the series, and the game included a goodly range of monsters, including Daleks, Special Weapons Daleks, Ogrons and Robomen, plus a number of home-grown baddies, such as gang members, giant rats and mutants. The graphics were produced by John Gyarmati and Wayne Dalton, with Nick Kimberley coding the PC, Spectrum and (never released) Amstrad versions. Richard Turner did the Amiga and ST conversions; Jason Heggie the Commodore 64 port. Paul Tankard did the music. After a side-scrolling opening level in which the Doctor and companion have to fly on Dalek hover platforms through the the London sewers while avoiding obstacles, zapping gloop creatures that slide down from the ceiling and shooting free trapped UNIT troops before eventually fighting a Dragon-like boss, the action shifts to the London streets and becomes a Mario Bros-style platformer. There are coins to grab, Sonic Screwdriver power-ups to find - here, the Doc’s handy gadget doubles as a raygun - human hostages to rescue and building interiors to explore. Three more Earth cities - Paris, New York and Tokyo - need to be sorted out before the Doctor gets to travel to Skaro, this time to locate and capture Davros. Sometimes K9 pops in to lend the Doctor some extra firepower. Now and then a Time Lord would appear with a choice of goodies. There wasn’t, I recall, much in the way of puzzling and the Doctor here relied far more on shooting things and lobbing Dalekanium grenades than he ever did in the TV series, but Dalek Attack was a lot of fun. It wasn’t particularly original, but unlike The First Adventure all those years ago, the Who elements were right up front, not relegated to the wording on the box. 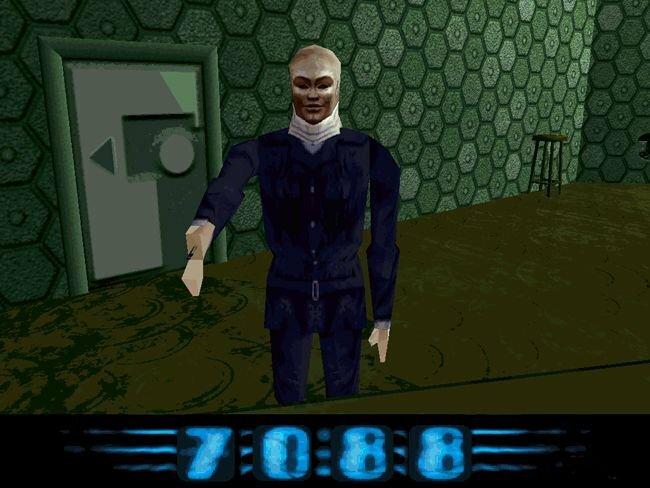 The problem was, it was a bit too hard: enemies just blast away when they see you, making it easy to cop it while trying to enter a building, and they also regenerate after death. 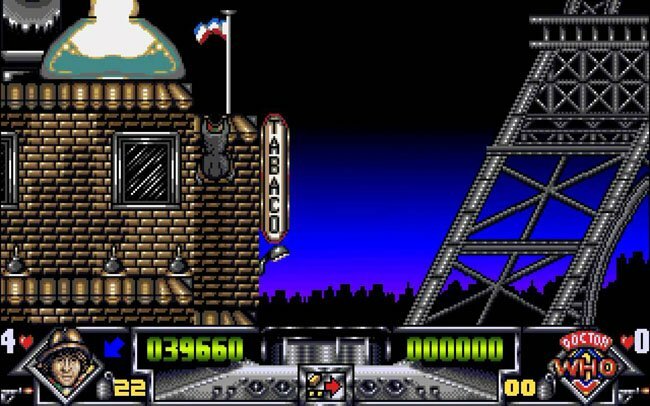 The graphics didn’t give visual clues as to which parts of buildings could be climbed and which you could jump on. And with no game saving, lose all your lives and you were right back to the start in the sewers. This happened frequently - Dalek Attack was hard. Some would say, ridiculously hard. 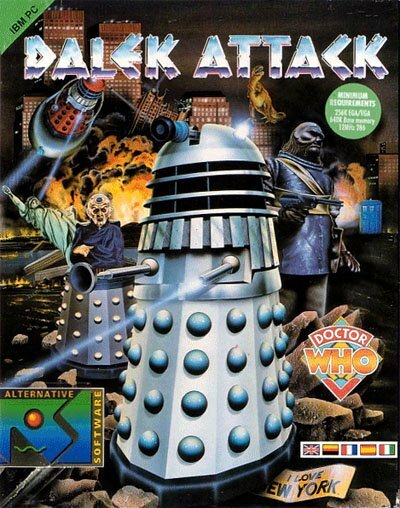 Alternative released Dalek Attack under its Admiral Software low-price label, and re-released it in 1993 in a modified form for the Spectrum. Not everyone liked it: Amiga Power magazine is said to have given the game a very low score, much to Alternative’s ire - it threatened to sue the publisher. Commodore Force gave it 80 per cent, but Your Sinclair was only willing to go to 56 per cent, perhaps not surprising given the cuts made to the Spectrum version. Dalek Attack was, nonetheless, the pinnacle of Doctor Who videogames. The BBC had yet another go five years later, with 1997’s Destiny of the Doctors, a 3D adventure in the style of a first-person shooter - but a lot less smooth and graphically sophisticated than the likes of Quake, so it’s no wonder it fared badly. It had plenty of Doctor Who content - the monsters included Daleks, Cybermen, Autons, Ice Warriors, Quarks, Sea Devils, Silurians, Sontarans, Yeti and Zygons, for instance: but they were a slow-moving lot. Real Doctors four through seven provided voice-overs, as did Nicholas Courtney as the Brigadier. Anthony Ainley made a video appearance as the master. Existing recordings were used to provide the voice of dead Doctors Jon Pertwee - impersonators did William Hartnell and Patrick Trougton. Essentially it was a collection of puzzles padded out with seemingly unnecessary quests and much aimless wandering around the Tardis avoiding the baddies. Gagdets would help you defeat them, but you’d have to interrogate the “Master’s Monster Database” to learn which one. Some were armed but none were particularly quick, so they were easy enough to avoid. But who’d bother with all that when there were Strogg to slaughter? Quake II went on sale in the same month as Destiny of the Doctors.